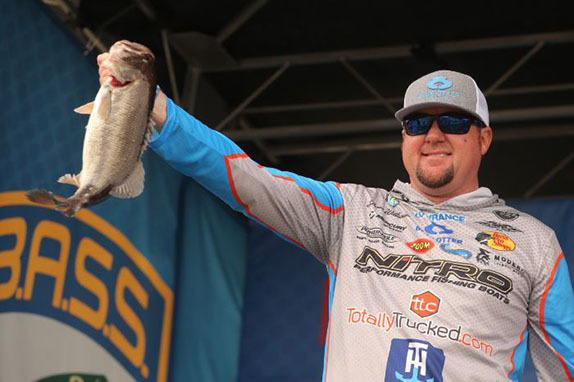 Stetson Blaylock's 9-03 stringer was enough to give him the win at the Winyah Bay Bassmaster Elite Series. 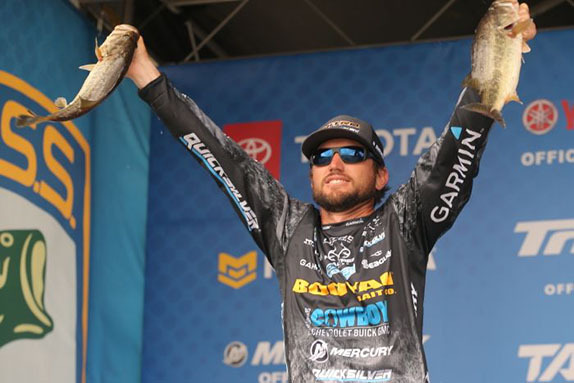 There was only one place Stetson Blaylock could finish in the final standings at the Winyah Bay Bassmaster Elite Series that would be an improvement over his runner-up showing the previous week at Lake Hartwell. That's exactly where he ended up. The Arkansan claimed his second tour-level victory and first in a decade with a four-day total of 50-15 on one of the most expansive, yet stingiest, venues in the sport. His 9-03 final-day bag was his lightest of the tournament, but it held off Scott Canterbury's massive charge by a 9-ounce margin. "It feels good, let me tell you," he said. "I didn't think I had a chance in the world after my performance today. I caught them so well leading up to this and I hated to end it this way, but somehow it worked out." Canterbury, who started day 4 in 8th place, caught a 16-02 bag that was the heaviest of the day by more than 5 pounds. The two-time FLW Tour winner finished with 50-06, with all but 19 pounds of that total coming over the final two rounds. "I went into the day thinking I had to have 23 pounds or better to have a chance," said Canterbury, who trailed Blaylock by 7 1/2 pounds after day 3. "Then when I came in, everybody was telling me about what happened and I knew it was going to be pretty close. "Five minutes before I had to leave I got a bite from a 2 1/2-pounder and that fish would've won it for me, but I never got him hooked." Cory Johnston ended up 3rd with 49-05 after a 9-01 effort on day 4. Jason Williamson, the day-1 leader, boxed 11-00 to finish 4th with 46-03 and John Crews completed the top 5 with 46-02 (9-01 on day 4). The lower half of the top 10 was comprised of Koby Kreiger with 45-03 (8-09 on day 4), Patrick Walters with 44-00 (10-04), Luke Palmer with 42-09 (6-12), Jesse Tacoronte with 41-04 (7-06) and Clent Davis with 40-12 (2-07). 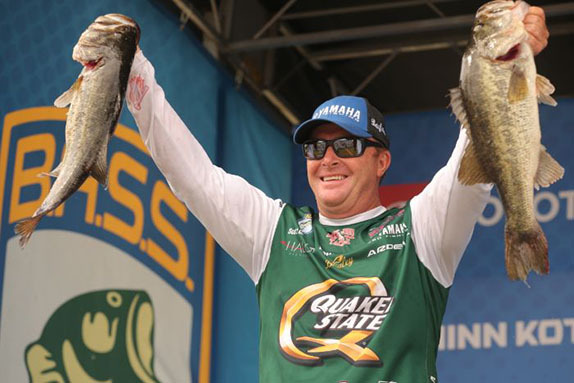 A pair of big fish propelled Scott Canterbury's big charge up the leaderboard on the final day. 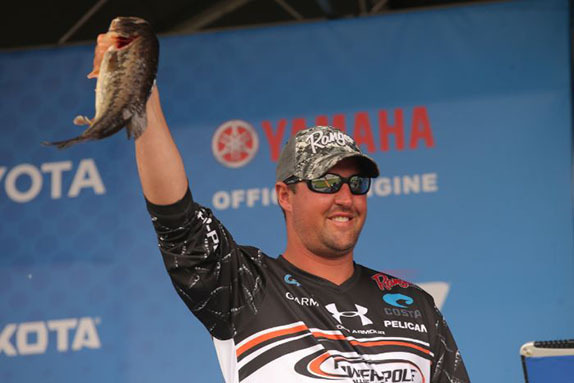 Canterbury is tied with Walters, a rookie, atop the Angler of the Year standings after four of the nine regular-season events. Blaylock is 19 points back in 3rd. None of the anglers in the top 6 positions to start day 4 managed a double-digit bag, which cleared the way for Canterbury's big rally. Making the long run to the Cooper River via the Intracoastal Waterway, he used a buzzbait to catch the two biggest fish of the day (6-01 and 5-08) � both true giants for the system. Blaylock, who weighed a tournament-best 17-15 to take over the lead on day 3, found the going far more difficult in the final round. Fishing much closer to the launch in the Waccamaw River, he had about 90 minutes more fishing time than Canterbury and caught a 1 1/2-pounder in the final hour that replaced a tiny keeper in his livewell. It proved to be enough to keep the challenger at bay. "It's crazy because I wasn't catching them good enough to think I even had a chance," Blaylock said. "That last upgrade made the difference � I had a 12-incher that I'm sure didn't weigh three-quarters of a pound." A wacky-rigged YUM Dinger and a YUM Christie Craw were his primary baits for the event and he caught one key fish on a Rebel Pop-R P70. Canterbury caught more than 15 pounds on a swimjig on day 3, but he said a gut feeling made him opt for a buzzbait in the final round. It produced four of his weigh-in fish and he sight-fished the other off a bed. "I told my camera guy this morning that the swimjig just didn't feel right," he said. "I hadn't had a bite on a topwater the whole tournament, but I'd gotten one or two bites on the buzzbait in practice. It just felt right � it was a real humid, muggy morning. Cory Johnston's day-4 bag was 8 pounds lighter than the one he caught the previous day. "I caught a couple of keepers pretty quick and then the water fell out real far (due to tidal fluctuation) and I moved out to the main river to some grass I'd found and marked, but I hadn't gotten a bite out of all week. On my first cast I caught the 6, and then I went to another spot that looked just like it and caught the 5 1/2." Johnston's day-4 bag was more than 8 pounds lighter than the one he'd produced the previous day. He went through about a dozen keepers, but only one was in the 3-pound class. He lost a 3-pounder late in the day that he didn't think was a huge deal at the time, but he was unaware that Blaylock would also come in with just over 9 pounds. "If you'd told me at the end of practice that I was going to finish 3rd, I'd have been happy to take that and go home," said Johnston, whose arsenal included a soft stickbait, a swimjig, a worm and a topwater. "You have to be happy anytime you make the top 10, but once you get into contention to win you look at it a little differently. "I'm disappointed, like anyone would be, because I had the fish on to win today. But that's the way it goes � I'll take the points and carry on to the next one." Williamson, who was fishing in his home state but visiting the venue for just the second time, wasn't the least bit perturbed with his final placement even though it was three spots lower than the position he held after the first day. He boated seven keepers on day 4, the biggest of which was a 4 1/2-pounder. Jason Williamson turned in a 4th-place finish in his home state. He spent the mornings flipping the banks in marinas and employed a dropshot in deeper water as the days wore on. "I'm ecstatic about it," he said. "This was one on the schedule I was worried about. It is in South Carolina and there might've been people who thought I had a lot of knowledge about it, but the only knowledge I had came from the first time we were here a few years ago. Before that, I'd never fished it. "I'd have loved to have won the tournament, but I'm the type who believes those things happen when they're meant to and it wasn't meant for me to win this week. It was a good tournament, things went as planned and I fished real clean." Crews handled 15 keepers in the final round, but all were under 3 pounds. He lost a 3 1/2 that cost him one place in the final standings. He relied on a jerkbait on day 4 when he discovered that the water he was fishing in the Cooper was without the "slime" it had contained on previous days. He threw a couple of different worms and a ChatterBait at other points during the derby. "It was a pretty good showing," he said. "I didn't get a break today or on the second day as far as getting a quality bite that really bumped me up there. I was in striking distance, but I just needed a couple of those big 'uns." > Day 4 stats � 10 anglers, 9 limits, 1 two.